It turns out to be just a bad dream. But for "Mohamed Abdallah," apathy about Election Day leads to his arrest. He is rousted from his bedroom, hooded, and dragged before a judge. "You didn't vote," the judge repeatedly says, his voice rising. Mohamed, a young American Muslim, is more interested in playing "Guitar Hero" than in any election. But the judge explains, "By not voting, you are forfeiting your right to change policy that could affect your community, your country and the entire world." He then sentences Mohamed to "a lifetime of silence," laughing maniacally as Mohamed begs the court to reconsider. Mahdi Bray plays the judge in this well-produced, lighthearted and terribly ironic video. Ironic because Bray, leader of the Muslim American Society (MAS)'s Freedom Foundation, has found himself before sentencing judges repeatedly in his life. And because he leads MAS's "Voting is Power" campaign effort. Yet like Mohamed, he didn't vote in November 2008, either. On a MAS website, Bray acknowledges missing the election but touts his status as a registered voter. Bray is, in fact, registered to vote in Washington, D.C., but his eligibility may be in question. Public records show he is a Virginia resident. But, his voter registration lists as his home address a Washington office suite on 17th Street N.W. that is listed on MAS websites as an office location. As a convicted felon, Bray can't register to vote in his home state of Virginia. As the Investigative Project on Terrorism reported Thursday, Bray was convicted on separate indictments of grand larceny and drug possession in 1981. In 1989, he began a three-year prison sentence after pleading guilty to mail fraud. For more than 10 years, Bray kept workers' compensation checks sent to his late grandfather, who died in 1975. He was released in 1991. Virginia is one of two states that do not restore voting rights to felons upon completion of their sentences without an appeal to the governor. 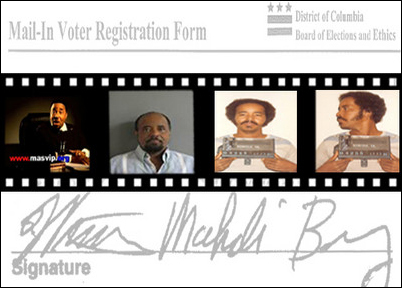 Bray has been a registered D.C. voter since late 1991, just a few weeks after his last release from prison, records show. In 2004, he updated his registration, switching from a Washington, D.C. residential address to the office suite. "WARNING: If you sign this statement even though you know it is untrue, you can be convicted and fined up to $10,000 and/or jailed for up to five years." The November 2004 election was the last one in which Bray voted. Three weeks later, Bray was cited for driving with no county decal, improper registration and driving with a suspended license in Falls Church, Virginia. The citations show Bray living at an Annandale, VA address. Similar information was provided in a July 2006 traffic stop. In a brief telephone call with the IPT Wednesday, Bray declined to comment or answer questions, including whether he is a Virginia resident. Beyond his criminal history and the voter registration issues, Bray has a history of defending accused terrorist supporters, and of offering misleading statements about his organization's history and his own actions. He traveled repeatedly to Dallas in support of defendants in the Hamas-support case against the Holy Land Foundation for Relief and Development (HLF). After a 2007 trial ended in a hung jury, the five defendants were convicted following a retrial in November on 108 counts. Bray also served as a character witness at a bond hearing for Sami Al-Arian, who was accused of providing support to the Palestinian Islamic Jihad (PIJ). After an initial trial in 2005 ended with a mix of acquittals and a deadlocked jury on other counts, Al-Arian pled guilty in April 2006 to conspiring to provide goods or services to the PIJ. Bray similarly has defended Ali Al-Timimi, who is serving a life sentence for soliciting others to wage war against the United States and attempting to contribute services to the Taliban. The conviction, Bray said, "bodes ill" for the First Amendment. Later this month, he will speak at a fundraiser for the Muslim Link newspaper with British Member of Parliament George Galloway. Galloway is fresh off a trip to Gaza, where he gave 100 vehicles loaded with supplies and an unspecified amount of cash directly to Hamas officials. Bray has made at least two trips to Cairo to stand in solidarity with Muslim Brotherhood members facing military tribunals for membership in a banned organization. Anti-war activist Cindy Sheehan accompanied Bray on his second trip to Egypt to stand in solidarity with members of the Muslim Brotherhood. After the IPT reported on the trip, Bray wrote an article in response, arguing his stop in Cairo was one among many and indicates his opposition to military tribunals more than support for the Brotherhood. "The reality is that my trip had less to do with the Muslim Brotherhood than with my organization's opposition to the human rights violations of Egypt-an American ally and the second largest recipient U.S. foreign aid." Federal prosecutors say MAS was "founded as the overt arm of the Muslim Brotherhood in the United States." A telephone book described in testimony by a prosecution expert witness as listing Muslim Brotherhood members in the U.S. includes Ahmad Elkadi, Jamal Badawi, and Omar Soubani, MAS's three founding directors. "In recent years, the U.S. Brotherhood operated under the name Muslim American Society, according to documents and interviews. One of the nation's major Islamic groups, it was incorporated in Illinois in 1993 after a contentious debate among Brotherhood members. Some wanted the Brotherhood to remain underground, while others thought a more public face would make the group more influential." Despite those documented links, Bray insists MAS was "established in America, and we are not an overt or covert arm of the Muslim Brotherhood." On the same web page where Bray acknowledges being a registered voter is a slide show under the heading "Mahdi Bray's Photos." It includes images of demonstrations and political events in the U.S. One frame features a picture of Hamas founder Ahmed Yassin, who was killed by an Israeli bomb attack in 2004. Hamas is an offshoot of the Muslim Brotherhood, created in the wake of the Palestinian Intifada in 1987. His own life story includes contradictions. As reported yesterday, Bray claimed last fall to be "celebrating 30 years of being a Muslim." That places his conversion in or around 1978. He told a probation officer in 1981, however, that he remained a Baptist who "attends church every Sunday and believes in God." It isn't clear whether he would exaggerate his time as a Muslim, or whether he lied to the probation officer. During the call with the IPT, Bray declined to answer when he became a Muslim or to discuss the criminal charges. In his mail fraud case, Bray was accused of submitting forged paperwork in his grandfather's name to keep the benefits flowing. He even gave what his indictment called "false and fraudulent" information to a Department of Labor claims worker during a brief office visit to drop off one such form. After his last prison sentence ended in 1991, Bray went on to become a public figure, working as political director for the Muslim Public Affairs Council, (MPAC) before joining MAS. He also served on an advisory board for the American Muslim Council. AMC founder Abdurrahman Alamoudi, is serving a 23-year sentence for illegal transactions with Libya and for facilitating a Libyan plot to assassinate Saudi Crown Prince Abdullah. Until his arrest, Alamoudi was among the nation's most visible and prominent Muslim political activists. Alamoudi pled guilty in October 2004. He staunchly defended Alamoudi before the guilty plea, however, calling the arrest a "witch hunt" aimed at "an attempt to marginalize the tremendous potential the Muslim Community has." Bray was not implicated in the Alamoudi case. In the fall of 2007, he passed off as a joke his enthusiastic response to a speech by Alamoudi in 2000, saying those present at a rally outside the White House were supporters of both Hamas and Hizballah. See the videotape from the 2000 rally here. Bray is spotlighted off to the speaker's side. His criminal record has been clean since the workers' compensation claim. He spent a few nights behind bars a year ago, however, as a result of his repeated traffic and vehicle registration violations. Court records indicate Bray has racked up more than 20 convictions over the years for improperly registered, tagged or inspected vehicles, and repeatedly driving on a suspended license. He was stopped for a 3rd time for driving on a suspended license on April 20th 2006. An arrest warrant was issued the next day. The case dragged out for nearly two years, but on March 27, 2008 Bray turned himself in to the Fairfax County Adult Detention Center. He was given a 90 day sentence, with 80 days suspended. He was released after serving three days. To read the first installment of this investigation, click here.